In 1850, a ruined building stood on this site which was classified as building ground. The eventual new house was occupied by a Miss Ince1 and, after her, according to the Cancellation Books, there came a veritable grand parade of occupants: Thomas Kavanagh, Martin Dowling, Daniel Dowling, Catherine Duff, Allen McKerney? 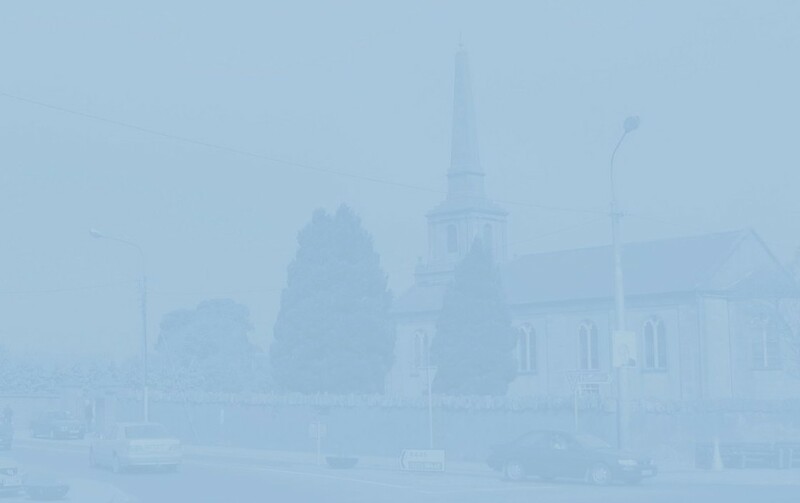 (the entry is unclear), Fenton Dunne, Thomas Swords (who had a public house here in the 1870's), Christopher Dennis, Patrick Cashin, Thomas Russell (another publican) and Michael and Catherine Kearney. Catherine's name appears on the 1901 census form as a widow and licensed publican. Also present that night were her daughter Margaret Nelson and young niece, Kate Condon. By 19112, grocer and publican Thomas Haslam, his wife Bridget and their two young daughters, Margaret Mary and Mary Bridget, were living here. The family kept two boarders; John O' Mara, a gamekeeper from County Carlow and his wife Delia from County Kilkenny. From the early 1950's, the premises were no longer licensed as a public house. Members of the Haslam3 family lived here right up to the 1970's. 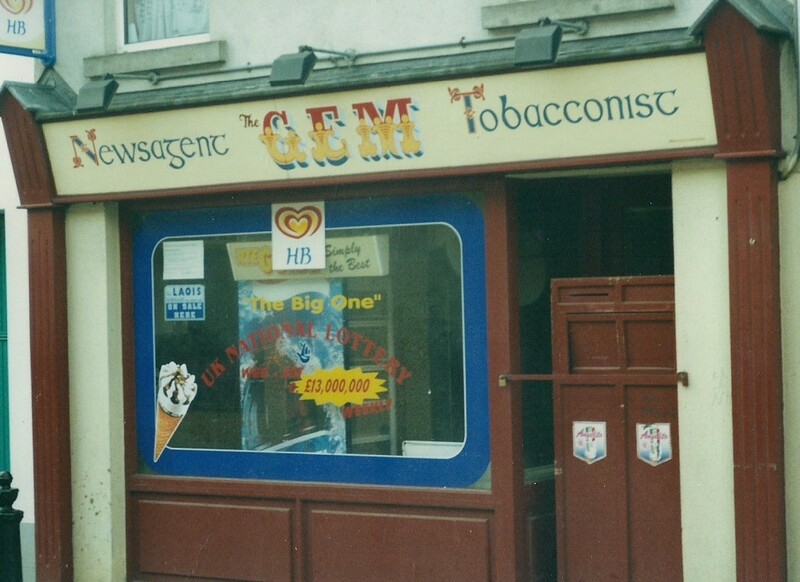 In the 1960's, Richard 'Ritchie' Haslam had a small old-fashioned shop which sold loose cigarettes to neophyte smokers like myself. In my memory, it is always Ritchie's Woodbines that introduced me to a habit that lasted until January 2000. But Craven A ("Craven A today, cravin' butts tomorrow") and Carroll's Number 1 - not to mention Major and finally, Silk Cut Red - also contributed to almost forty years of self-harm. In the 1980's, Bernard Connolly had bookie offices here and at 43, Main Street. Jim and Phil Kingston's The Gem was succeeded by Frames and Art owned by Paul Owens, an accomplished artist who held his first solo exhibition here in February, 2010. His business was succeeded by Country Craft Supplies (Graphic Design services. Wedding Supplies) and it, in turn (April 2014), by 1 Hour Phone Service (We fix it all). The unit was vacant for a while until Avini (Your electronic cigarette specialist) opened in 2016. It was replaced by a similar shop, the Vape Vault. 1 Possibly Esther Ince, a draper and ironmonger in the town in the 1830's and '40's. A manuscript map from 1803, incidentally, shows just two houses on the land that later became Coote Street. The one on the corner of the Market Square was owned by a Mr Ince. 2 N.B. The Census for that year lists this and the next house in the wrong order. 3 The surname reminds me of something from the town's history that both intrigues and eludes me. On February 29 1772, the following appeared in Finn's Leinster Journal: "The gentlemen of the Ossory Club intend dining together on Saturday the 4th of April at Haslem's (sic) great room in Maryborough." Any information on the location of this venue would be most welcome.